When you travel overseas, it's likely you will require local currency to get around and make small purchases (big ones normally can be charged). To do so, you will need to exchange your own currency (such as US Dollars or Euros) for coins and banknotes of another country. Before you travel, learn what the currency exchange rate is in the country you plan to visit by using the Universal Currency Converter. Free and pro versions of the XE Currency App are available for both iPhones and Androids. In whatever format you use, this utility provides an idea of the latest available exchange rates, based on the mid-point between the buy and sell rates of large-value transactions in global currency markets. Many travelers, especially those flying a long distance and landing in a foreign country early in the morning or late at night when banks and currency exchange desks may be closed, prefer to acquire a small amount of foreign currency before they depart on a trip. Having the local equivalent of $100 in your pocket is usually enough to pay for a cab ride to your destination, a snack, and small incidentals without having to search for a currency exchange open for business. 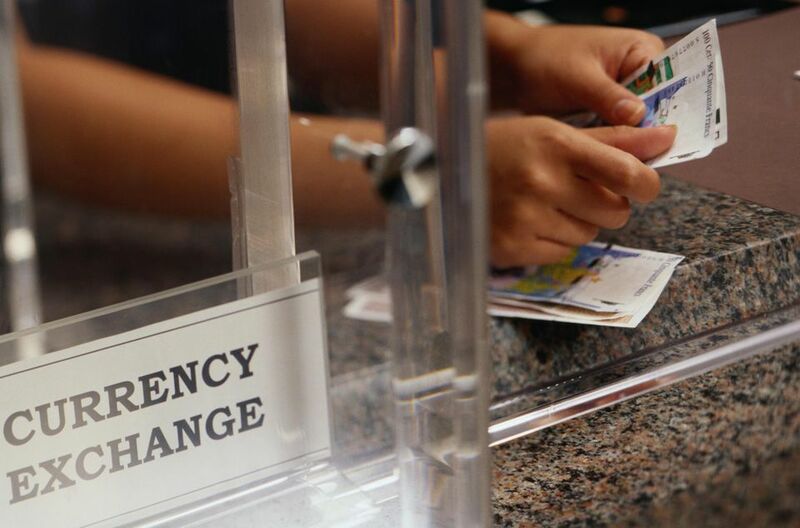 In large cities, major banks and travel agencies sometimes feature a currency exchange desk. Some hotels also offer this as a courtesy, but their exchange rate is rarely as good as a bank's. To get the best exchange rate, wait until you arrive at your destination. While most major airports feature a currency exchange desk, you are likely to get a better rate directly from an ATM machine affiliated with a major bank. ATM cards most likely to work trouble-free overseas are those with a four-digit PIN number. Since you may be charged a usage fee by both the local bank and your home institution, it's advisable to make one large instead of several small withdrawals whenever possible — and keep your cash in a safe place out of pickpockets' range. As long as you have a working PIN number, it's likely that you can also use your credit or debit card to get cash overseas. Credit cards with chips are the most universally accepted. Having a credit card is especially useful when you travel. With one, it's unnecessary to carry large sums of money. Use a credit card rather than cash to pay for larger expenses, such as hotel bills and major purchases, since you will have a receipt of the transaction. If a bill is disputed, your credit card company may be able to help you settle the matter when you get home. Do keep in mind, however, that the majority of credit card companies levy an additional fee for overseas usage. If you're not sure, check with your company before you leave home. American Express offers American Express Gift Cards. Similar to a pre-paid debit card, these let buyers load up to $3,000 on a card for a nominal fee and withdraw up to $400 daily at ATMs that show the American Express logo. Young people 18 or older who don't have credit cards and individuals with bad credit may want to purchase a pre-paid card from Visa or Mastercard. As credit and ATM cards have become more popular, fewer and fewer people choose to go to the trouble of buying traveler's checks. Nonetheless, they remain a secure way to carry money. Merchants in some countries welcome American dollars instead of the local currency. This is common in a number of Caribbean nations, including the Bahamas. While this is a convenience, you are likely to pay less for goods and services if you use the local currency.